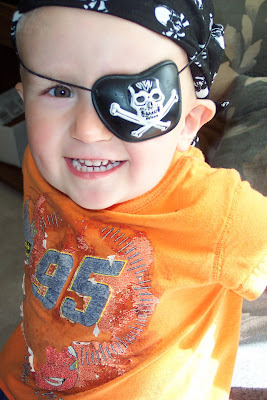 Last Monday, we were feeling a little "piratey" around here. 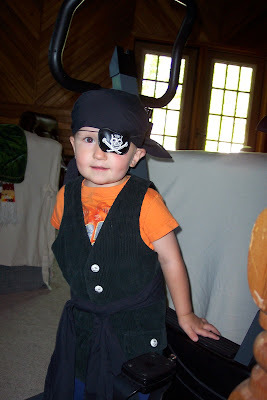 Since I can almost never, if ever, resist the face of a cute little boy in a black do-rag and eye-patch, here are some photos of my littlest two pirates. Noah couldn't resist dressing up, too. Apparently, the eye patch gets in the way of actually seeing. The eye patch didn't seem to bother Jabin as much. 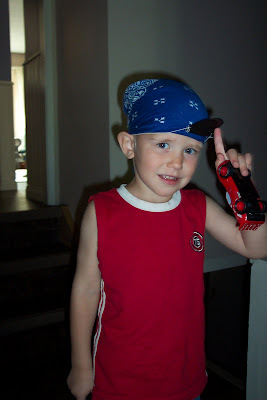 He kept taking his off, but then insisted on putting it back on. Or rather, having Mommy put it back on. Only about 80 times or so, and then Mommy thought that it was getting a little old!